These high performance loudspeakers are custom built in the USA by hand to meet your exacting needs. Sign up today to receive the latest ESL-0.5 news! Custom order. Contact us for delivery time. Introducing true full range electrostatic loudspeaker performance at a fraction of the cost of other brands! 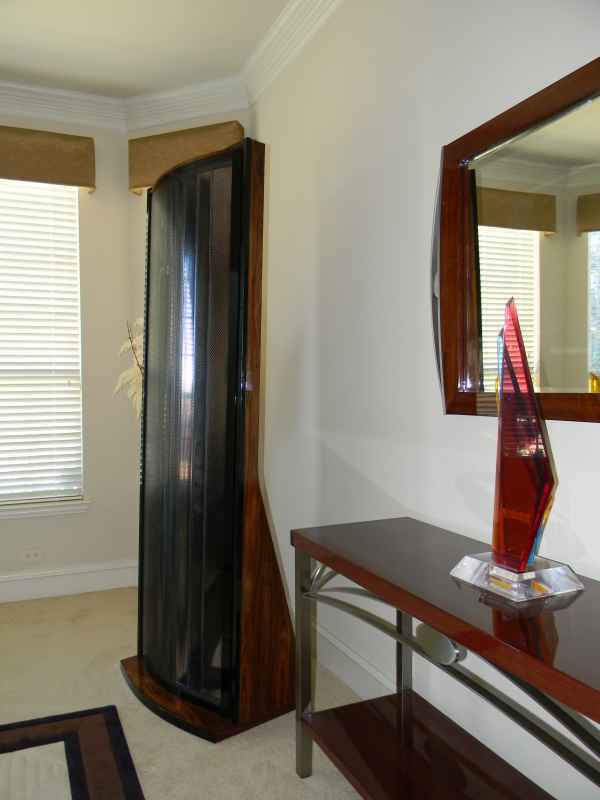 Until now high end full-range electrostatic loudspeakers such as these were only available starting in the $20,000-$30,000 USD range and quickly moved upwards from there. 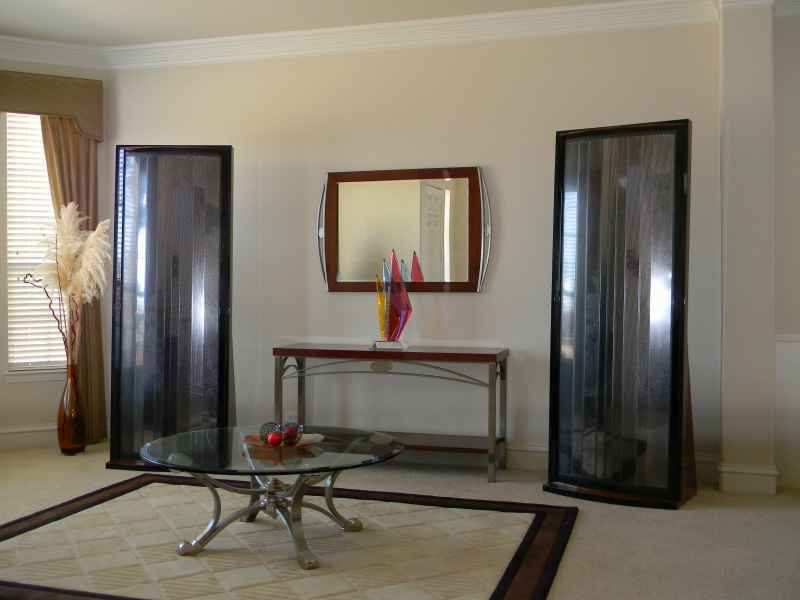 You can now own a pair of full-range truly 100% electrostatic loudspeakers for a fraction of the cost of other brands! Customers who have compared the ESL-0.5 with the 'other' big name brand electrostatic speaker series (at 4-5 times the price) tell us that the ESL-0.5 sound every bit as good. 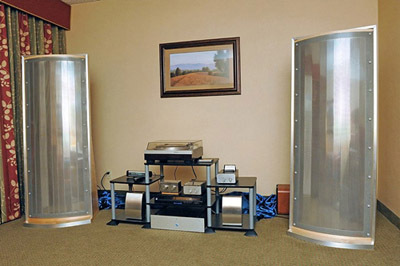 Our Crescendo-Systems partner through CurtPalme.com is able to reduce costs due to the lack of audiophile sales & marketing mark-up costs typically applied to high-end low-volume audio products such as these. The gently curved design avoids the high frequency beaming normally associated with a large screen full range design. 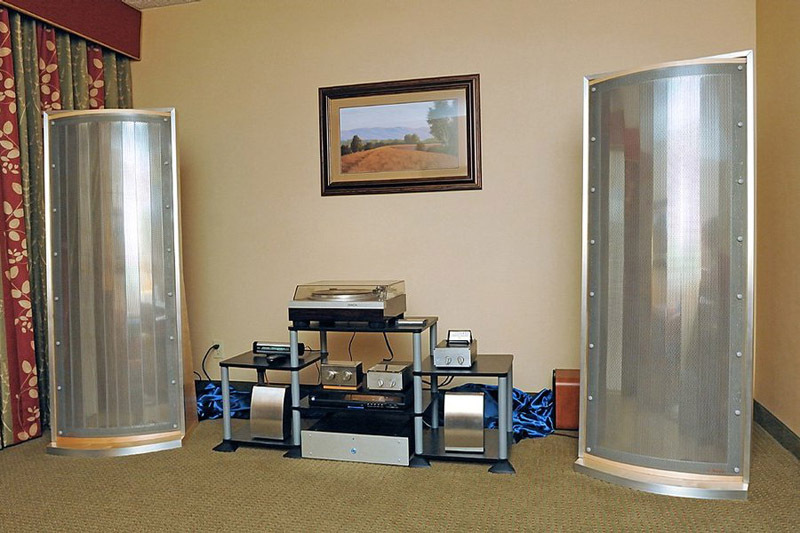 These true full-range loudspeakers do not have any crossover or cone driver(s) to muddy up the sound. Hear what you've been missing! These speakers are best suited for high-end audio setups where transparency, musicality, and imaging are of paramount importance. The ESL-0.5 is hand built in the USA to customer specification and can therefore be customized with respect to size, color and finish to suit a particular request. Please contact us with your requests and personal needs. 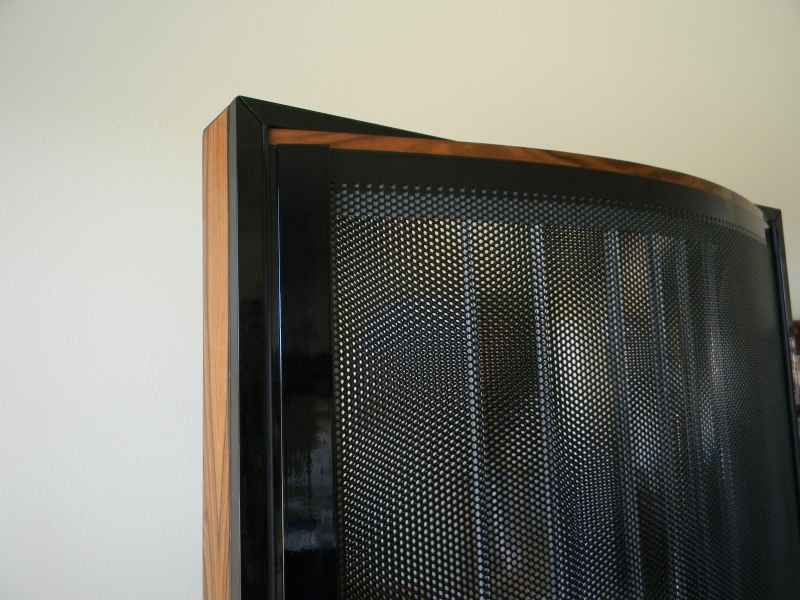 Electrostatic speakers offer an openness and transparency that is simply not possible with conventional cone designs due to the laws of physics. Very few people who have purchased electrostatics will go back to using conventional cone speakers after hearing what they've been missing. The stereo placement of electrostatics is far superior to that of regular speakers. The sound of regular boxed cone drivers never seems to leave the speaker. In electrostatics the stereo image is fluid between and beyond the panels, it is something you really have to hear yourself. "Advantages of electrostatic loudspeakers include levels of distortion one to two orders of magnitude lower than conventional cone drivers in a box, the extremely light weight of the diaphragm which is driven across its whole surface, and exemplary frequency response (both in amplitude and phase) because the principle of generating force and pressure is almost free from resonances unlike the more common electrodynamic driver. Musical transparency can be better than in electrodynamic speakers because the radiating surface has much less mass than most other drivers and is therefore far less capable of storing energy to be released later. For example, typical dynamic speaker drivers can have moving masses of tens or hundreds of grams whereas an electrostatic membrane only weighs a few milligrams, several times less than the very lightest of electrodynamic tweeters. The concomitant air load, often insignificant in dynamic speakers, is usually tens of grams because of the large coupling surface, this contributing to damping of resonance buildup by the air itself to a significant, though not complete, degree. Electrostatics can also be executed as full-range designs, lacking the usual crossover filters and enclosures that could color or distort the sound." Specifications are dependant on the size of speaker chosen. The speakers typically range in size from 2' - 3'3" wide and 5 - 6'6" high. CurtPalme.com special price: $3745 USD/pair. You save $250! Custom sizes and finishes are possible. Contact us with your requests for exact pricing. The larger 3'3" wide by 6'6" high will add approximately $1000 USD to the price. 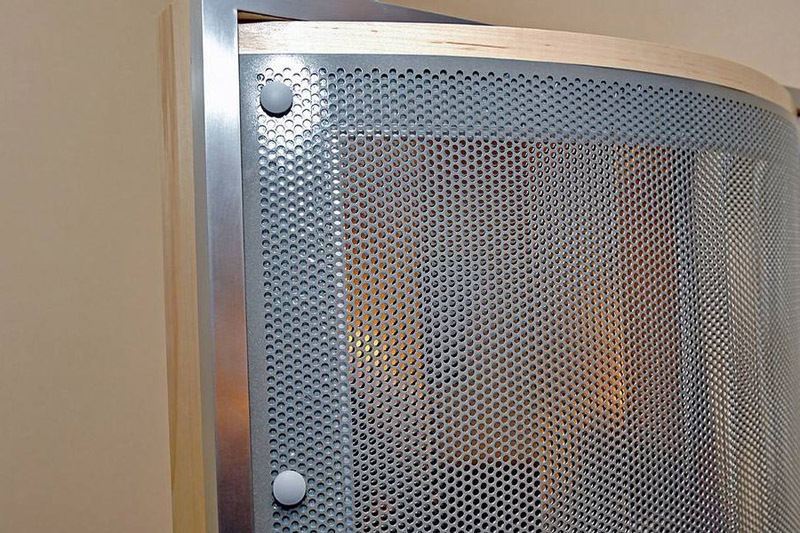 These electrostatic loudspeakers are a single panel design with absolutely no crossover. Generally speaking, when blending with a sub-woofer, the ESL-0.5 should be crossed over to a subwoofer at the standard THX crossover point of 80Hz. This blending point works great as the cross-over frequency is well below that of the human voice. The transition to sub is not noticed. For 100% audio use many users will chose to not use a subwoofer at all. (Note that many other hybrid electrostatic speakers require a considerably higher cross-over point, often as high as 300-400Hz. This to us is unacceptable as the sound of a cone subwoofer and the panel in the critical lower mid-range does not match and is easily heard). 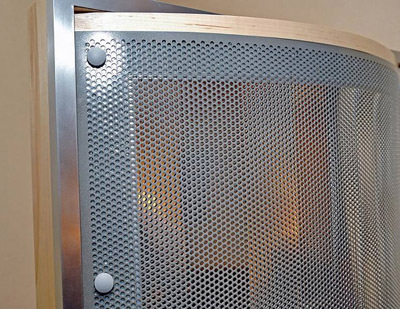 From a technical point of view an electrostatic loudspeaker is just a thin membrane in between two perforated steel plates. The magic is in the coating of the membrane in order to hold charge. Many people and professional brands use graphite, liquid soap, PVA glue, nylon solution (such as Quad), some conducting polymer (such as Martin Logan) or anti-static spray (also a conducting polymer). We use metalized foil after years of extensive tests and in our opinion there is no downside, we cannot hear or measure a quality difference. 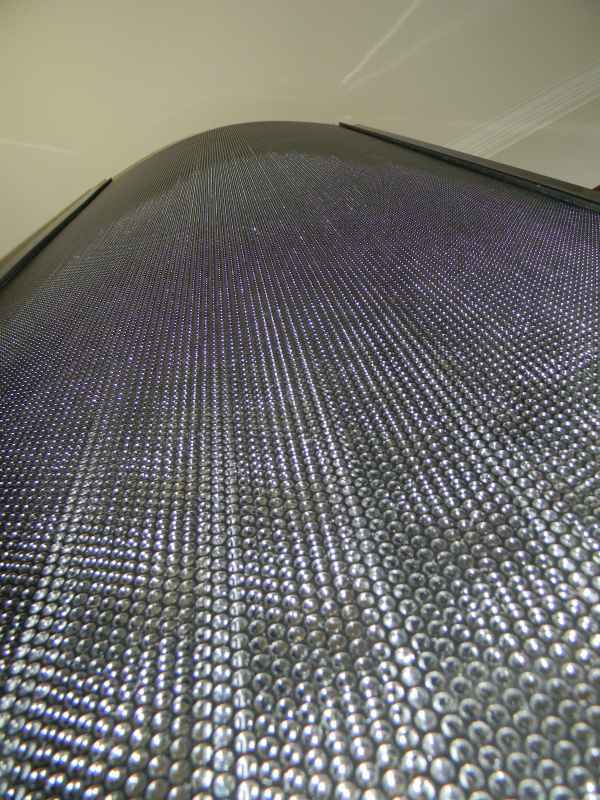 A big benefit of using metalized foil is that all of the issues with wetting the membrane and any environmental factors like extremely dry (an issue with nylon coating) or moist air are completely avoided. Many of the other brands will not perform correctly in a house with dry (winter) or moist (summer) air. Custom ESL-0.5 Electrostatic speakers (2' wide, 5' high) finished in natural birch with brushed aluminum accents. Need more information? See our official ESL-0.5 forum thread! Curious how these are built? 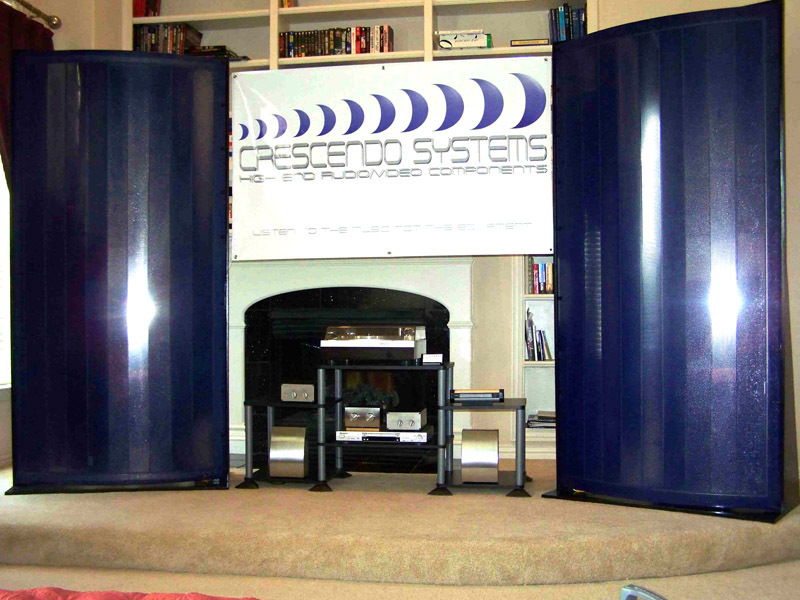 See this forum thread where Kim of Crescendo-Systems documents the steps involved in building a pair of these custom loudspeakers. When purchasing you will be paying and dealing directly with the third party seller 'Crescendo-Systems'.